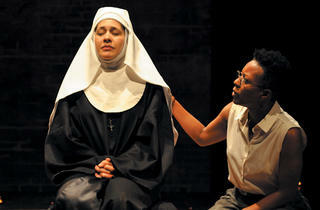 Doubt and Agnes of God make for an ambitious if overly demanding pairing of plays. A Catholic priest is accused of a sexual transgression with a young boy. A nun strangles her newborn child and dumps the body in a wastebasket. 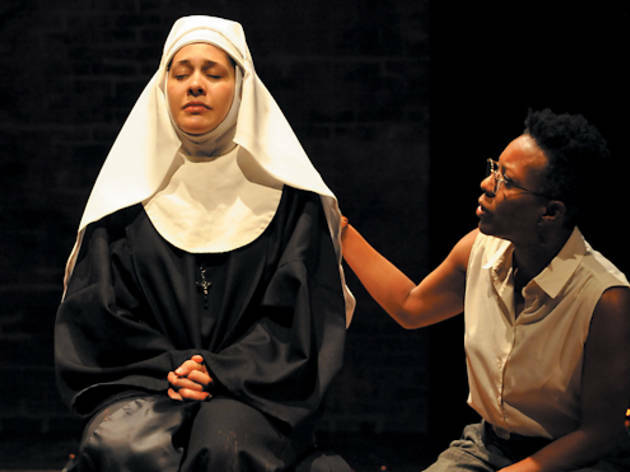 The two plays of American Theater Company’s Catholic Repertory are challenging, provocative dramas, dissecting Catholicism to expose the flaws in its practices. In both cases, the church does more harm than good, denying the human failings of those in God’s service for fear of compromising the religion’s strict sense of order. Pairing John Patrick Shanley’s 2005 Pulitzer Prize– and Tony Award–winning Doubt with John Pielmeier’s 1980 drama Agnes of God leads to a heavy night of theater, and using the same cast for both plays is an ambitious, if misguided, decision. Performing in both plays is an emotionally and physically exhausting task that takes its toll on the three women. There are a few too many line flubs, and the energy dips in places. The success of Shanley’s script hinges on Father Flynn (Lance Baker) and his accuser Sister Aloysius (Kate Skinner) being equally matched; while Skinner captures her character’s self-righteousness, she lacks the conviction that what she is doing is for the greater good. Her issues with the pastor are personal, and she becomes a full-on villain when she’s put against Baker’s heartbreaking portrayal of Father Flynn. Baker creates a believable image of a man who has engaged in no inappropriate conduct but still struggles with something buried deep within. From a supportive but exhausted mother in Doubt to a hardened psychiatrist in Agnes of God, Penelope Walker makes a striking physical transformation, but line trouble plagues her latter performance. There is a seismic shift between Sadieh Rifai’s passive Sister James and deeply damaged Sister Agnes. Rifai’s two characters are united by their innocence and naïveté, despite manifesting those qualities in different ways. ATC has assembled a strong cast for these powerful works, but the Catholic Repertory needs some extra polish to become a truly transcendent experience.